For a very long time, carbs have been demonized in the fitness world – they make you fat, cause insulin raises, cause bloating, hold water, etc. 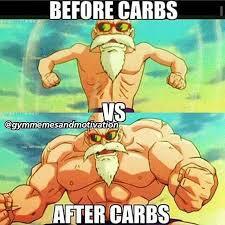 Carbs are freaking awesome! They can make you train longer, recover faster, and look better. Carbs are a non essential nutrient. Carbs make you gain weight. Only in a caloric surplus. The end. Carbs cause insulin to rise. True, but…elevated insulin levels at the right time are essential for building muscle and,the insulin fairy cannot make you magically gain weight. What do I mean by that? Insulin in itself has zero calories. In order to cause fat gain it needs calories to be shuttled into the fat cells. In other words, a low glycemic diet of protein and fats will make you just as fat as a sugary one if you overeat. Carbs make you hold water. True, but meaningless. We all can store anywhere from half to three pounds of glycogen in the body, which then binds four times the amount of water to it. This is your initial weight loss during a keto diet when the water gets flushed out. Unless you plan on never eating a carb again, it will come back. Mind you, it is water, not fat. Here is a very smart quote from my old coach that I tell my NYC personal training clients “you have to earn your carbs”. Meaning? The leaner you are and the more you train, the more carbs you need/ deserve. So, to start, I would set my intake at one gram per pound of bodyweight and see how my body reacts. Do I get stronger? Do I gain weight? Do I lose weight? How is my recovery affected? From there on, and depending on whether you are bulking or cutting, you manipulate the number up or downwards. So, if used properly, cars are pretty much the single greatest tool to gain muscle and lose fat. Previous post: Can You Build Muscle and Burn Fat at the Same Time? Next post: How many carbs do you need?